Who knew that making a big honkin' loaf-sized sandwich and flattening it under cement blocks, rocks, or gym weights could be so fun (or so delicious)? 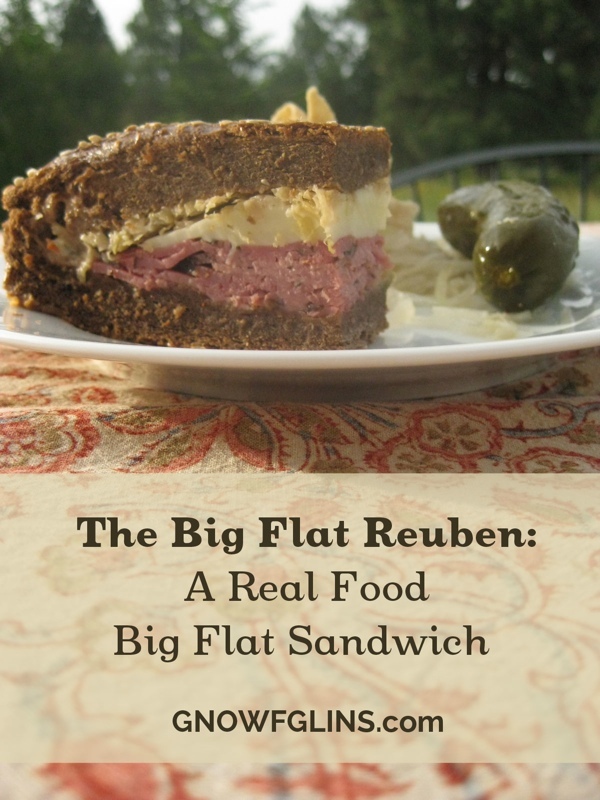 I'd seen other Big Flat Sandwiches around Pinterest and other blogging circles, but when Wardee first presented the idea of making a real food Big Flat Sandwich, I immediately knew I needed to try my all-time favorite sandwich — the Reuben. The classic Reuben is a real food sandwich teeming with cultured and fermented foods — it's a sandwich to be celebrated, with traditional corned beef, Swiss cheese, sauerkraut, and Thousand Island dressing layered between thick slices of toasted sourdough rye bread. After making this version of a Big Flat Sandwich, I'm definitely inclined to try other. It's an easy way to make a big meal for a crowd, and you can serve up a hearty dish for supper without hearing complaints that you made sandwiches again. The only caveat I'll make for creating Big Flat Sandwiches is that they are dense! You're packing a lot of bread, meats, and cheeses into each portion. These quantities are definitely changeable. Use whatever you have and in whatever quantities you like! Just remember, the higher it's stacked, the more likely you'll have spillage during the squashing phase. 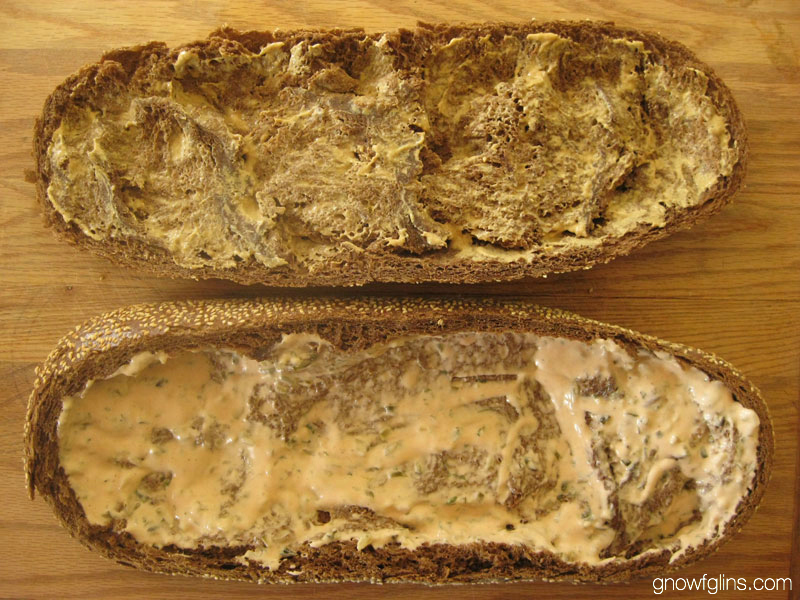 Slice the rye loaf open horizontally (the long way). Partially scoop out the inside of each half of the loaf, then slather the mustard and the Thousand Island dressing on both the top and the bottom halves. If you're making your own dressing, I recommend leaving out the vinegar in order to keep the dressing as thick as possible. Keep in mind that the runnier the dressing (and the more you slather on), the more it's either going to ooze out of the bread during the squishing stage or seep into the bread, thus making it soggy. Personally, in future loaves, I might leave the dressing out and just serve it as a dip on the table. Add the corned beef, followed by the Swiss cheese slices, and top with the sauerkraut. Replace the top half of the loaf and drool in anticipation. 🙂 Tightly wrap the stuffed loaf in either parchment paper or aluminum foil. 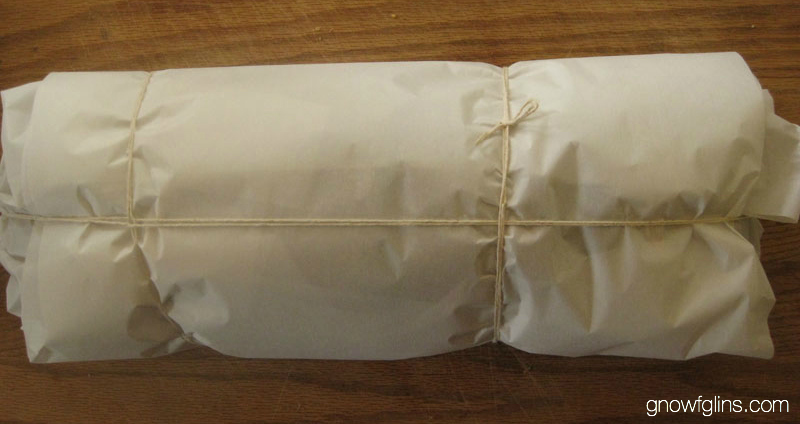 If you have kitchen twine, tie it up like a package to help keep everything intact while flattening. 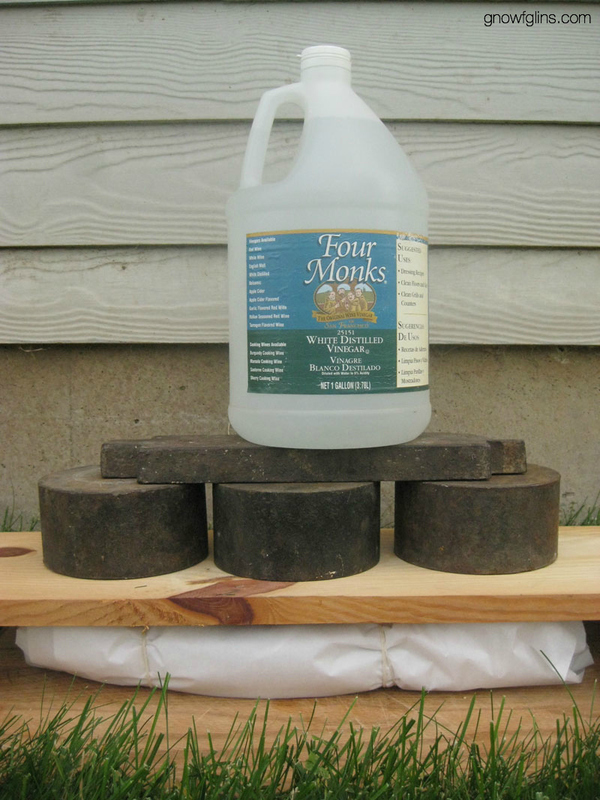 Place the wrapped loaf on a hard, flat surface in an cool area, then place a wide, flat board on top. 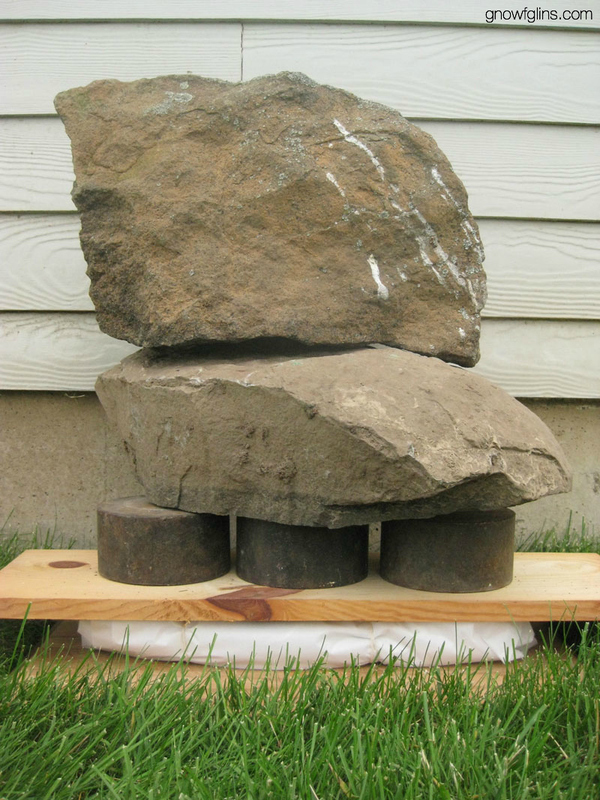 Layer on several heavy items, such as cement blocks, weight-lifting weights, bricks, large books, rocks, etc. Just be careful to place the heavy objects somewhat centered over the loaf so it flattens equally across the sandwich. The pictures below show 2 different weighting setups. Let sit for 4 to 6 hours, then remove weights, unwrap, slice into individual portions, and serve. 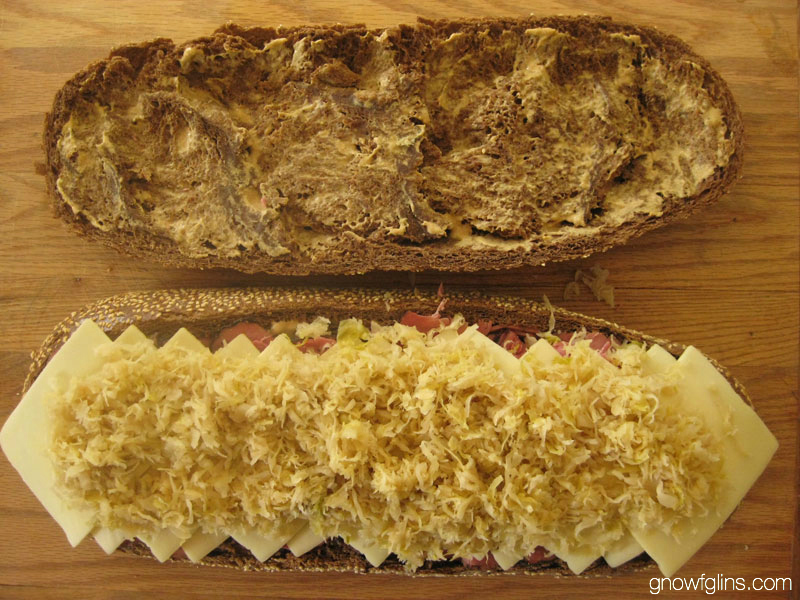 Need help finding ingredients for a Big Flat Reuben sandwich? 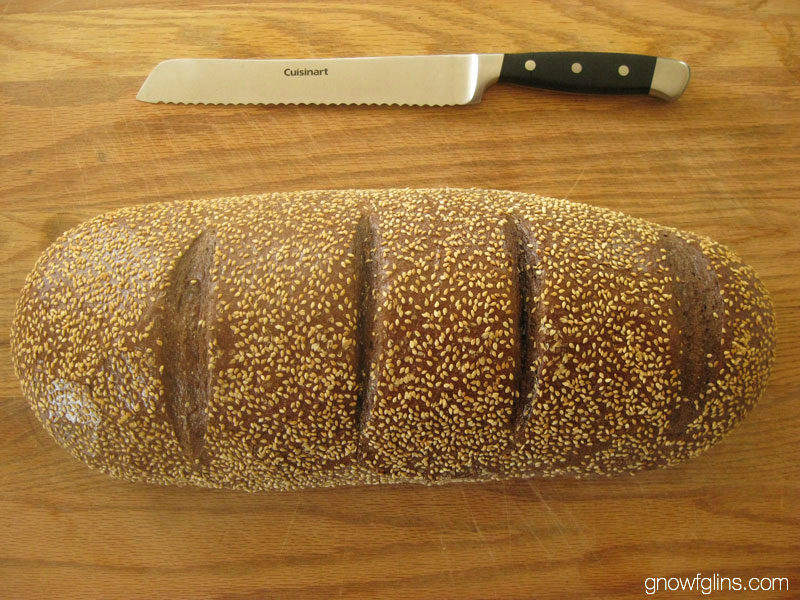 Learn how to make sourdough rye bread or find it at a local artisan bakery. Learn how to make Thousand Island dressing or buy it online (unfortunately, even the 100% organic brands use soy or canola oil, just FYI). Get the recipe for Dijon and honey mustard in The Complete Idiot's Guide to Fermenting Foods by Wardee Harmon or buy it online. 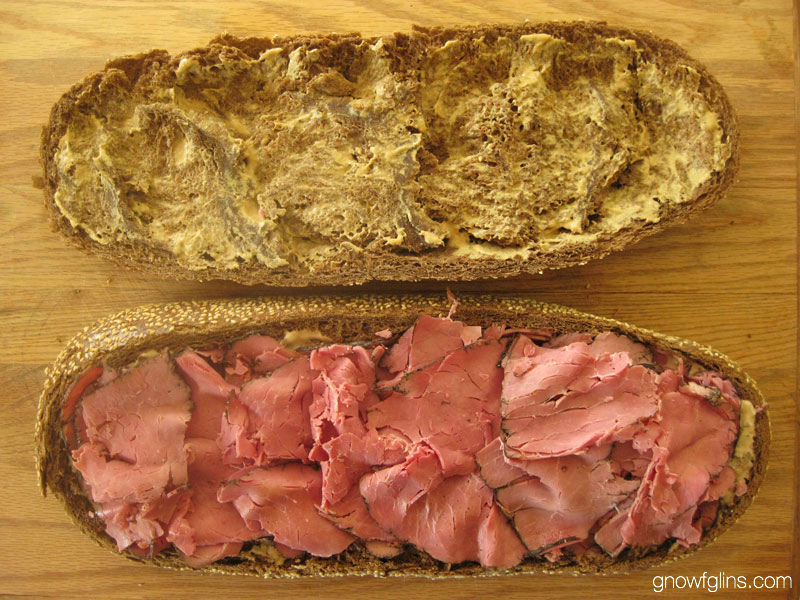 Learn how to make corned beef (included with Traditional Cooking School membership) or find it at a local deli. Learn how to make Swiss cheese or find it at a local deli. Learn how to make sauerkraut or buy it online. Ever made or eaten a “big flat sandwich” before? What kind? What kind of real food big flat sandwich would you like to see in the future? This will be great for the summer as it won’t heat up the kitchen but it looks like it would be filling enough for dinner. I look forward to giving it a try. 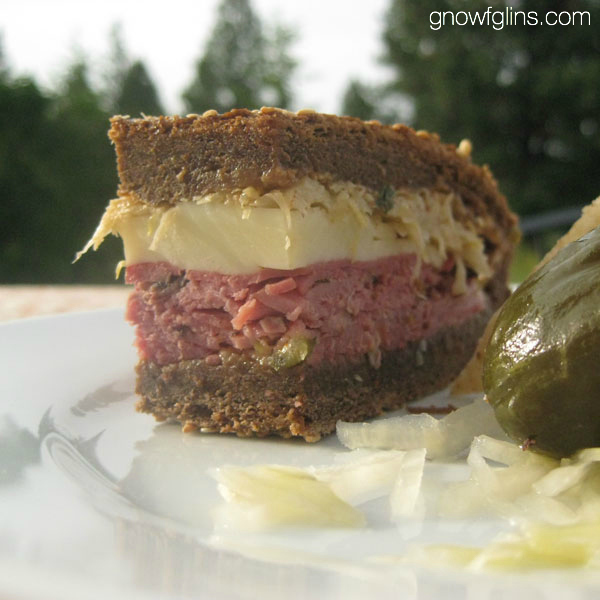 Do you seriously mean you leave your Reuben under weights OUTDOORS? For 4-6 hours? In summer? I notice Erica reminds everyone it’s important to keep the sandwich cold while pressing. She did mention putting it in a cool place for the pressing. Also, the fact that all ingredients are either cooked or fermented decreases the risk of spoilage. I’m not sure how relevant it is, but my sandwiches sat inside my backpack for summer camp easily 4-6 hours before I could eat them in the Georgia summer, no ice packs. No funkiness was ever detected on my own part.